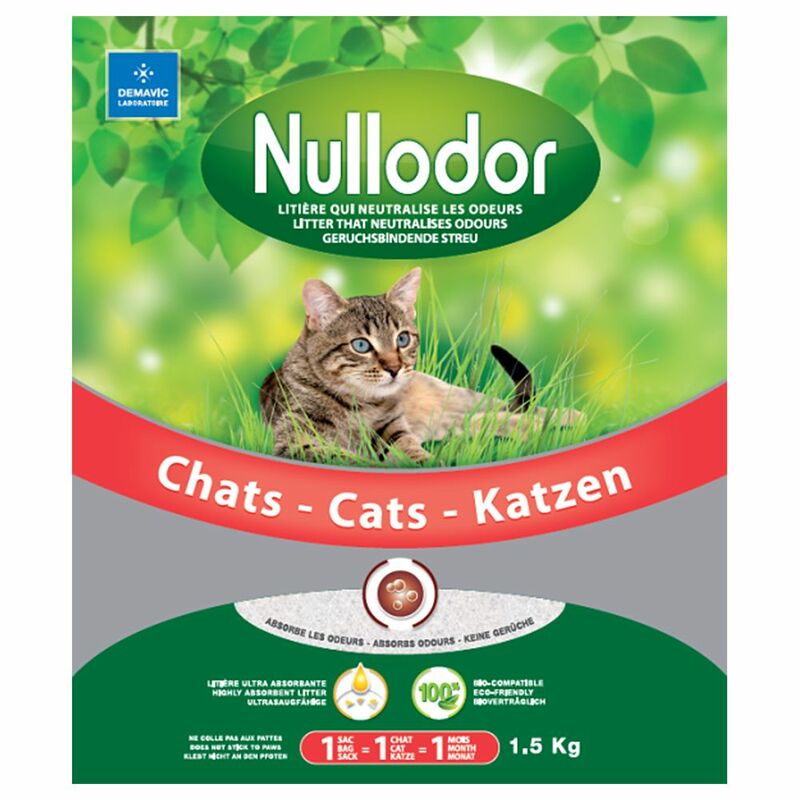 Nullodor crystal silica litter for cats is a new generation of litter granules. The micro-pored crystals absorb liquids very quickly and effectively so your cat will always have a pleasant, dry litter tray and you will only have to replace the litter every 4 weeks. Nullodor is a 100% natural product. It is compostable and neutralises bad smells in your cat's litter box. Nullodor is made from micro-porous granules with micro-capillaries. Each crystal has an absorption rate of 150%, absorbing liquids in a fraction of a second, then the moisture evaporates slowly to leave dry litter that can be re-used for a long time. Nullodor completely locks away odours for a month. They are absorbed at the same time as the liquids. Whilst the liquids evaporate, the odours are trapped in the centre of the silica granules, totally blocking ammonia emiΒions, so everything remains clean and fresh. After a while the cat litter will begin to turn yellow. This does not reduce its effectiveneΒ, however it is important that excrement is removed on a daily basis and the litter should be moved around every day to avoid saturation of the same area. Nullodor is antistatic and dust-free. It does not stick to your cat's paws. A 1.5 kg pack only takes up a little room and is very economical. Nullodor Silica Litter at a glance: No more unpleasant odours from the cat litter tray Economical: 1 cat = 1 bag = 1 month Does not take up much storage space: only 1. 5 kg of litter per pack Continuous absorption and odour retention Antistatic – does not stick to paws Eco-friendly: 100% natural product Non-toxic: safe, even if your cat accidently eats it Instructions for use: Pour a layer of Nullodor , at least 5 cm deep, into the clean litter tray. Remove all solid matter daily, and give the litter tray a good shake so that the litter is thoroughly mixed. Change the litter completely every 4 weeks. . All components in Nullodor have been approved and recognised as non-toxic by the FDA (Food and Drugs Administration).